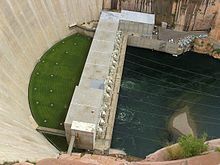 Glen Canyon Dam is a concrete arch-gravity dam on the Colorado River in northern Arizona, United States, near the town of Page. 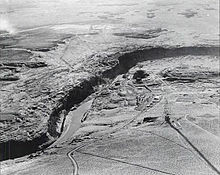 The 710-foot (220 m) high dam was built by the U.S. Bureau of Reclamation (USBR) from 1956 to 1966 and forms Lake Powell, one of the largest man-made reservoirs in the U.S. with a capacity of 27 million acre feet (33 km3). 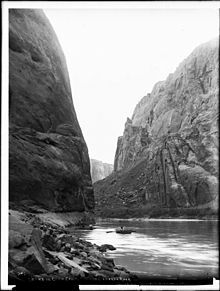 The dam is named for Glen Canyon, a series of deep sandstone gorges now flooded by the reservoir; Lake Powell is named for John Wesley Powell, who in 1869 led the first expedition to traverse the Colorado's Grand Canyon by boat. 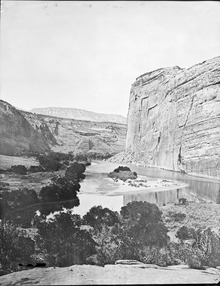 In addition to its flooding of the scenic Glen Canyon, the dam's economic justification was questioned by some critics. 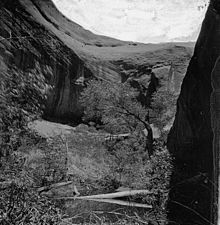 It became "a catalyst for the modern environmental movement,"  and was one of the last dams of its size to be built in the United States. 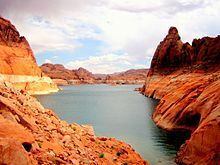 The dam has been criticized for the large evaporative losses from Lake Powell and its impact on the ecology of the Grand Canyon, which lies downstream; environmental groups continue to advocate for the dam's removal. Water managers and utilities state that the dam is a major source of renewable energy and provides a vital defense against severe droughts. ^ Spence, John R.; LaRue, Charles T.; Grahame, John D. (2011). "Birds of Glen Canyon National Recreation Area, Utah and Arizona". Monographs of the Western North American Naturalist. 5 (1): 20–69. doi: 10.3398/042.005.0102. ^ a b Myers, Tom (2013-06-21). 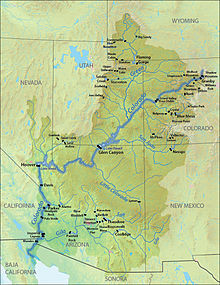 "Loss Rates from Lake Powell and Their Impact on Management of the Colorado River". Journal of the American Water Resources Association. 49 (5): 1213–1224. doi: 10.1111/jawr.12081. ^ Graf, William L.; Wohl, Ellen; Sinha, Tushar; Sabo, John L. (2010). 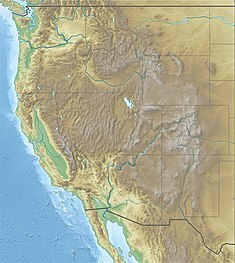 "Sedimentation and sustainability of western American reservoirs". Water Resources Research. 46 (12). 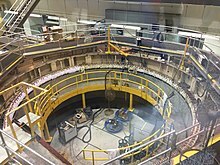 doi: 10.1029/2009WR008836.